This is Treasure II. She was born at the Aquarium on June 19, 2002 and has a red and yellow bracelet on her right wing. 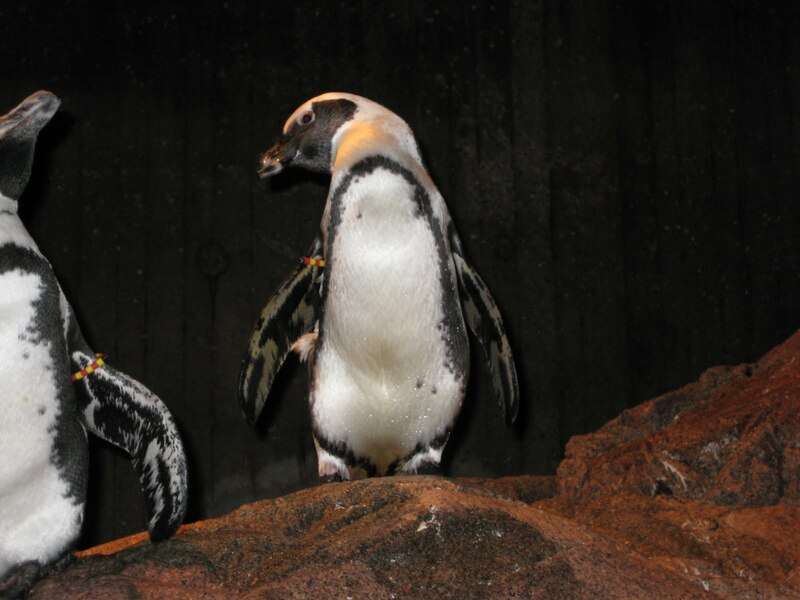 As most of you have figured out, we give our penguins specific names that describe a little bit about the species. Most of them are named after important breeding areas. But this penguin’s name reminds us of a major problem facing penguins in the wild – oil spills. 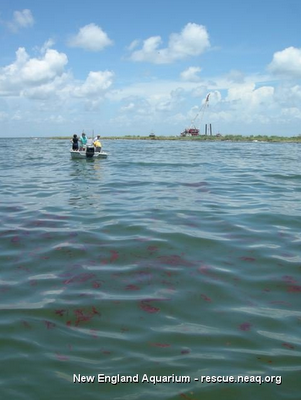 When oil gets in the water it sits on the surface. As penguins and other seabirds (and any other air breathing aquatic animals) surface to breath they swim right through the oil and become covered in it. 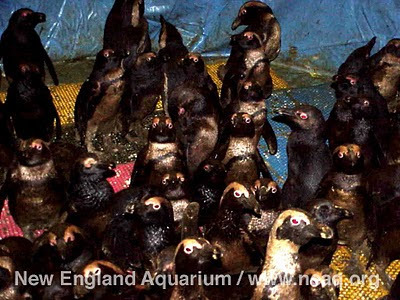 For penguins this is disastrous. The oil ruins the waterproofing qualities of their feathers. 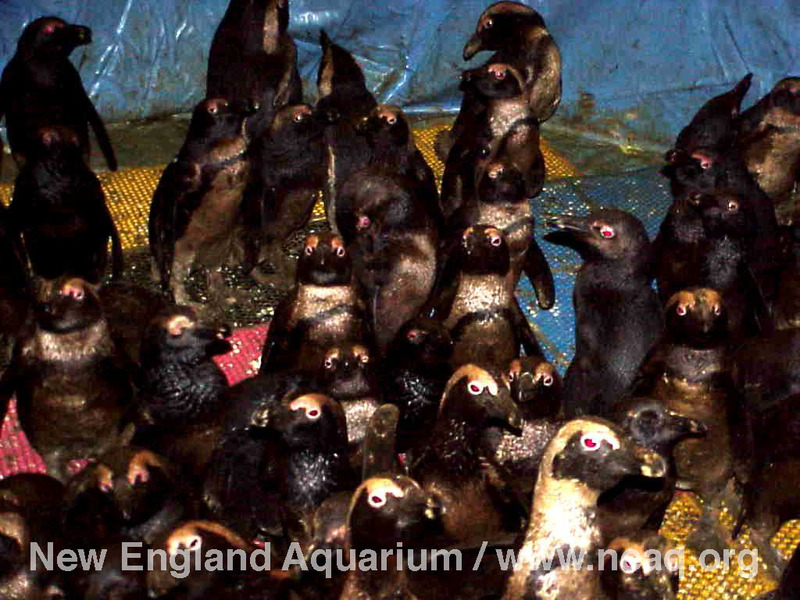 If a penguin stays in the cold ocean water it can become hypothermic, but if it stays on land it could starve. This is a lose - lose situation. On June 23, 2000, the damaged bulk ore carrier MV Treasure sank, spilling 1,300 tons of bunker oil off the coast of South Africa. The spill occurred between Robben and Dassen Islands, two of the largest breeding islands for the African penguin, in the middle of one of the most successful breeding seasons. 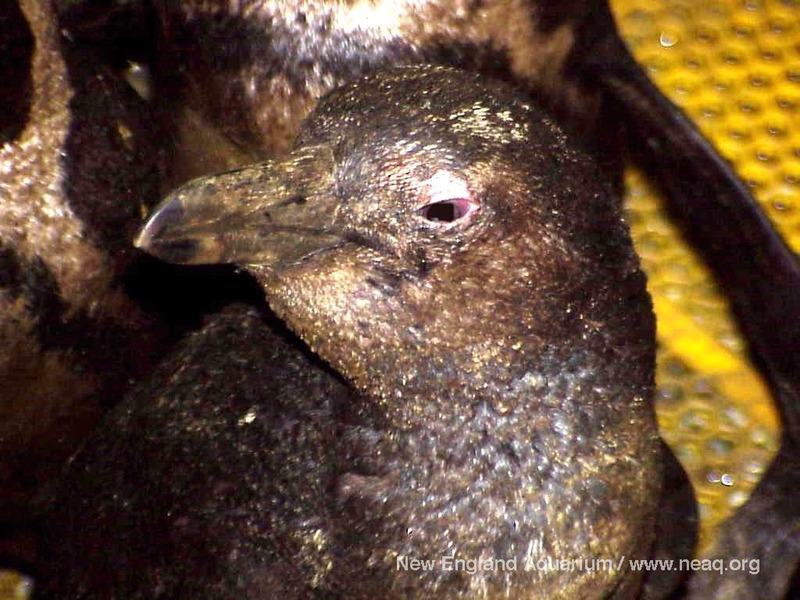 Within days thousands of oiled penguins started showing up on the beaches along South Africa and its islands. Treasure II is named after this ship and reminds us of the devastating effects oil has on penguins and the incredible international effort to clean up this oil spill. If you have been reading the Aquarium's Marine Animal Rescue Blog you may already know that the Aquarium sent two staff members (our head vet Dr. Charles Innis, and Connie Merigo from our Rescue & Rehab Department) to the Gulf to assist in the Deepwater Horizon oil spill clean up. In addition, the Aquarium's president and head of the Board of Trustees visited the Gulf coast to see the damage firsthand and observe ongoing clean-up efforts. 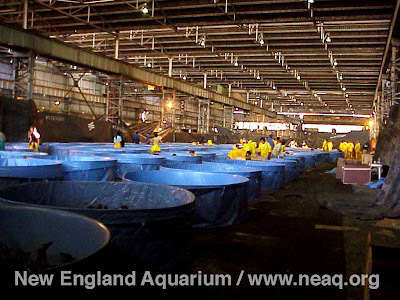 What most people may not know is that nearly 10 years ago, the New England Aquarium sent staff to South Africa to assist with the Treasure spill and utilize their expertise in animal husbandry to keep the 20,000 oiled penguins alive while they waited to be washed. Here are some photos taken by Heather while she was in South Africa. 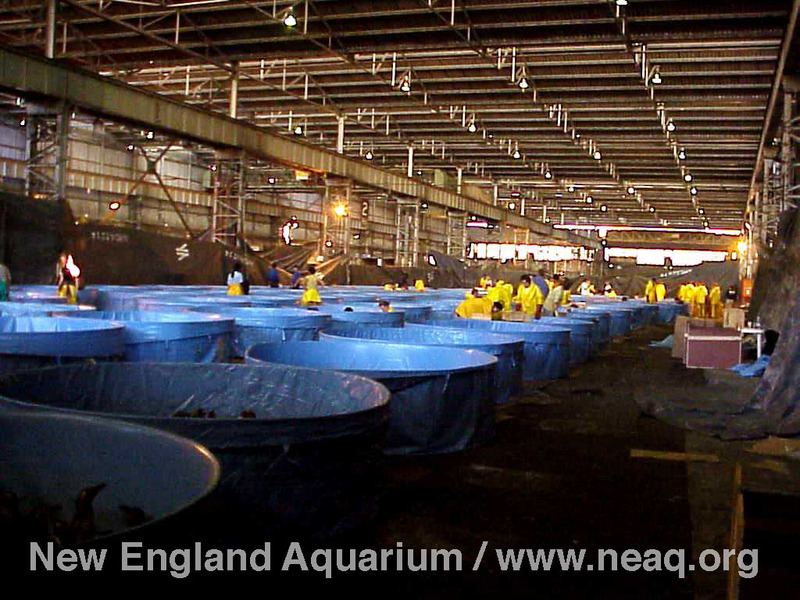 This is just one of several massive rooms where the oiled penguins lived while they awaited being cleaned. Each blue tub is filled with penguins, just like these. 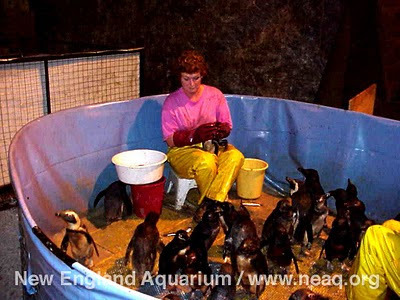 In the days and weeks that they wait to be cleaned, each penguin needed to be hand fed by staff and volunteers. 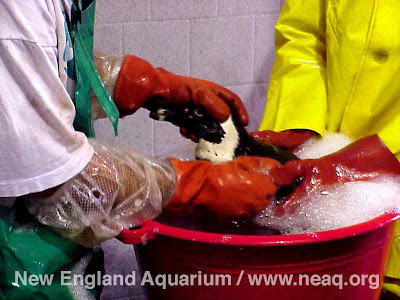 Each penguin was hand washed using dishwashing soap and rinsed thoroughly to remove all the oil. This was one of the names I submitted for the contest, and I had no idea it was actually taken! Makes me feel a little better about losing.